On January 25, 2006, the Department of Commerce, U.S. Chamber of Commerce, and National Space-Based PNT Coordination Office organized a public media forum on next generation GPS capabilities. The event was intended to publicize the availability of the new second civil GPS signal (L2C) and its usefulness to U.S. industry. Two panels of industry executives then highlighted their specific uses of GPS and next-generation GPS across a broad cross-section of the U.S. economy, including agriculture, construction and mining, logistical supply and shipping, telecommunications, transportation, and surveying. Specific points raised are summarized below. 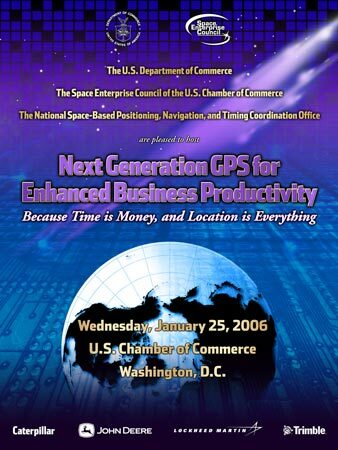 U.S. GPS Industry Council: Chairman Charlie Trimble stressed the importance of providing a stable, basic system to encourage innovation by the market. He noted that none of today's productivity-enhancing uses of GPS were designed into the original system. Instead, they grew out of private sector innovation enabled by a level playing field. Caterpillar: Chuck Schaidle demonstrated how GPS is revolutionizing the earth-moving industry, including construction, mining, and landfill management. Caterpillar GPS users can now construct six house pads per day rather than two per day. GPS-enabled mining operations have experienced a 30% increase in operational productivity with GPS. Errors in ore handling have dropped from 17% to 7%. A landfill in Arizona has used Caterpillar GPS to increase its ground density by 12%, leading to $1.4 million/year in savings and a longer lifespan for the site. IBM: Christan Beckner discussed IBM's initiative to standardize processes for the global movement of people, goods, conveyances, money, and information to increase efficiency, transparency, and homeland security. He highlighted the critical role of GPS in the initiative, which is currently being implemented in the container shipping industry. General Motors/OnStar: Vice President Bill Ball discussed current and future use of GPS in automobiles. The hottest growth area is in telematics, which combines GPS with cellular and voice recognition technology to provide hands-free navigation services. There are already 5 million telematics subscribers in North America, including 4 million at OnStar. On one day in September 2005, OnStar responded to 49,532 requests for assistance. Starting in 2008, OnStar will be a standard feature on all GM vehicles. For the future, GM is planning a vehicle-to-vehicle communications system that uses high accuracy GPS to increase situational awareness and avoid hazards. GPS modernization will be instrumental to enabling this higher accuracy, lane-level capability. 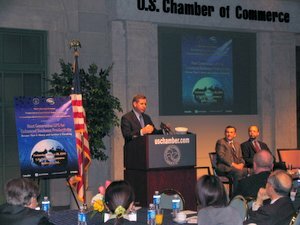 Ball emphasized the need to "do no harm" to the original civilian GPS signal and its installed base of users as we add new capabilities to the satellites. Lucent: Vice President Brenton Greene highlighted the fundamental role of GPS in wireless communications. All telecom systems that use Code Division Multiple Access (CDMA) technology, such as Verizon and Sprint, critically depend on GPS time at the cell towers to synchronize networks, encrypt/decrypt messages, locate towers, etc. New phones are also being embedded with GPS to enable E-911 and location based services. Next-generation GPS will improve the performance of those devices in terms of indoor reception, altitude determination, reliability, and overall performance. The third civil signal will improve the performance of cell towers. Lucent is aggressively taking advantage of next-generation GPS. Stanford: Dr. Per Enge provided an overview of the aviation benefits of GPS, particularly in challenging terrain. He also illustrated a next-generation GPS-guided helicopter used for detecting unexploded ordnance. Trimble: Vice President Bruce Peetz complimented the U.S. Government for providing a stable policy environment for GPS innovation and for consistently maintaining the constellation at or above its advertised performance level. He contrasted GPS with Russia's Glonass, which deteriorated in the 1990s. He noted that centimeter-level GPS accuracy is already available today, but only through complicated and time-consuming methods that most consumers cannot tolerate. He said GPS modernization will bring centimeter-level accuracy to the masses by making it much simpler and faster to use, but only after the third civilian signal is launched. State of Washington: Gavin Schrock discussed Washington's Statewide Reference Network, used by surveyors, public utility managers, seismologists, and other state/municipal workers. He said users are thrilled about next-generation GPS because it speeds up their work and gets them out of dangerous locations (e.g., street traffic) faster. Schrock discussed the use of high accuracy GPS to monitor the structural integrity of dams, reservoirs, bridges, and buildings. He also noted its use to improve the efficiency of cranes at shipping ports, to detect earthquakes, to monitor tides and floods, to replace survey control markers, and to manage physical assets. He praised the GPS modernization program as both an improvement in service and a show of commitment to GPS itself. John Deere: Ron Hatch of John Deere/NavCom Technology discussed how GPS technology is paving the way to automated farm operations. GPS now helps with yield monitoring, precision applications of seed and chemicals, enhanced documentation, etc. Many users report that the technology pays for itself within 1 to 1.5 years. It also has environment benefits. John Deere has been selling dual-frequency GPS equipment for years, but it is highly susceptible to interruptions. The new second civil signal eliminates that problem. It is much more robust and can rapidly recover from passes under trees or other obstacles. Hatch expressed enthusiasm about the third civil signal, which may enable global, centimeter level accuracy without local augmentation. U.S. Arctic Research Commission: Mead Treadwell highlighted several major activities in the Arctic that are critically dependent on GPS and next-generation GPS, including commercial shipping, fishing and fisheries management, oil exploration and mining, mapping and boundary dispute resolution, glacier monitoring and environmental science, and safe air navigation in challenging areas. He called upon the government to maintain GPS and other vital infrastructures to enable these activities to continue. 8:30 a.m. - 8:35 a.m.
8:35 a.m. - 8:40 a.m.
Panelists from companies providing innovative solutions to a broad range of industries discuss how GPS is enhancing their customers' productivity today. Panelists discuss expanded applications performance from next generation GPS capabilities and their usefulness to U.S. business and other real-world operations.